Please note that a large part of the Assessment is work that 3Back will perform offsite. The Scrum Maturity Assessment is designed to identify areas requiring improvement as well as areas of successful Scrum application within your organization. Through a combination of observations, interviews and Q&A with the Scrum Teams and those who interact closely with them, 3Back will provide feedback and recommendations for improving and strengthening your Scrum practices. The Assessment includes a thorough debrief and discussion via teleconference of 3Back’s findings and recommendations, as well as a written report of the same. Are your Scrum Teams reaching their full potential? Are you unable to identify what’s holding them back? Have you identified your Teams’ challenges but don’t know how to address them? Sometimes it’s hard to see the forest through the trees. There are moments in life when an objective external point of view can often identify both positive and negative patterns that are not visible from “inside the picture.” The Scrum Maturity Assessment provides this unbiased and expert view of your Teams, your organization and your Scrum application. Once we’ve been onsite for your Assessment, we will gather and coalesce the information into a Proposed Action Plan for your organization. A teleconference will be scheduled within a few weeks of your Assessment at a mutually agreeable time. During the teleconference, we will discuss our findings and Proposed Action Plan. Many companies offer a Scrum Assessment with a primary goal of selling you follow-on services and products. However, our goal at 3Back is to empower and educate you and your organization to inspect and identify positive and negative patterns to support continued growth and improvement after we’ve gone. Application of active and passive information gathering techniques – Getting “assessed” can be nerve wracking for some people. We use a variety of information gathering techniques to help maintain a positive comfort level for everyone involved, resulting in more accurate information. 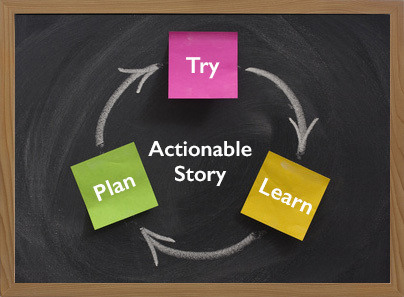 Recommendations for a Proposed Action Plan – We’ll provide the recommendations and framework necessary for you to form Actionable Stories for improvement, supplying you with the knowledge to continue to identify and improve even after we’re gone. 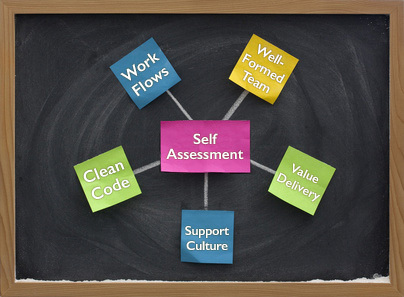 Team Self-Assessment measuring proficiency in 5 key areas – Self-perception is everything. We’ll walk your Teams through a self-assessment to measure how they perceive their own proficiency levels, pinpointing further areas for enhancement. Identification of current positive practices – It’s not always enough to know how to improve; it’s also critical to know what’s already going right. Our Assessment pays attention to both of these areas, ensuring you don’t change the positive practices you currently have. Utilization of Scrum to fine tune Scrum – We believe there’s no better way to improve than through iterative inspection and adaptation. Not only does this method encourage rapid change, but also reinforces the Scrum framework and tenets. Most importantly, your success is our success. We love it when our clients invite us to come back, but we love it more when we can teach them to succeed without us. Using the Scrum Maturity Assessment, we can evaluate up to two teams per day. 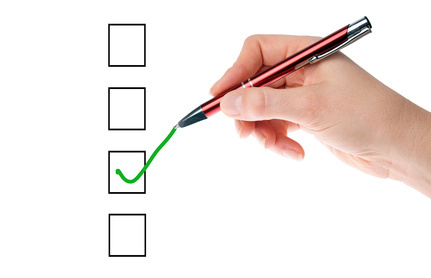 In organizations with a large number of Scrum teams, it is not necessary to assess each team. To provide an accurate representation of your Scrum implementation, we recommend that at least 20% of your teams be assessed. We are happy to help you determine which teams would be best for this activity. Once it has been determined which teams will be assessed, we will involve those team members, their ScrumMasters, Product Owners, Stakeholders, Managers and other key individuals who work directly with the selected teams. A preliminary verbal debrief will occur with Leadership at the conclusion of the Assessment.